Intelligent discussion & contributions are encouraged. At the same time, gratuitous posting of pro-Duterte spam will be removed along with those who post it. We also affirm the basic tenet of moral consequentialism, namely that you cannot achieve good by doing evil, nor do good works compensate for evil deeds. So please spare us any detritus regarding Duterte's accomplishments -- he's well past redemption. The often repeated promise of Rodrigo Duterte, President of the Philippines, is "I Will Kill You." This will be difficult to watch but please, watch. In the video shown below is Gembe "Jimbe" Casas, 23 years old, shot by the police in Tuburan, Cebu, in an altogether familiar PNP (Philippine National Police) narrative we now know as Nanlaban (false claims of "resisting", often involving planted weapons). President Duterte is on record himself as ordering Philippine police officers to plant guns as needed to substantiate "nalaban" claims. 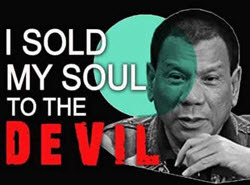 On 20 December, 2016, Duterte was quoted in the Philippine Star newspaper as saying, "Suspect unarmed? Give him a gun!" And the police seem to be complying with those instructions -- in the Metro Manila area the same revolver -- same serial number -- miraculously turned up in 29 different "nanlaban" cases. As we are all aware, there has been a spate of "naanlaban" tales in Cebu these past months. The cops say that Gembe had in possession, sachets of shabu (known as "methamphetamine" in much of the world) and a gun, seized from him in a buy-bust. LIE, says Alma Areja Cangmaong, Gembe's first cousin who forwarded the video to me. Gembe did not. Gembe was outside his workplace, about to go home with his sibling, as witnesses attest. As witnesses also say, Gembe was pleading for mercy from his assailants as he was being gunned down. To no avail. In the thousands of killings since Rodrigo Duterte began his War on the Poor, this has become an all-too-faamiliar scene: Unarmed, innoccent people dragged out of their homes and shot as they plead for their lives. The video is very distressing to watch. At one point the police officer rolls Gembe back to the middle of his gurney, and everyone (including the medical staff that are supposed to be saving his life) just step back & watch as he continues to writhe in pain and bleed to death. Eventually, Gembe died from his wounds. No. Correction. Gembe was killed. "I will kill you," is Duterte's War on Drugs rhetoric that he boldly pronounces again, and again, and again. This is how the victims die, this is how they are killed, as shown in the video. Brutally, bloodily, mute forever at the injustice. Older posts here before I posted on FB for a couple years. Current posts are above under Dutertissima Deteriorata.